This is the Original Petport Shipper made by Horizon. 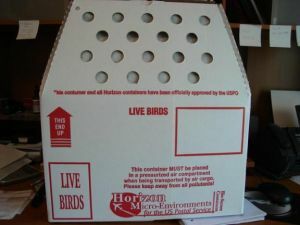 They are the bio secure boxes needed to ship live fowl. This is for 12 single stall boxes. Box size is 18 tall X 8 Wide X 18 long. Filters are installed. We can ship to All 50 states, HI, PR, AK will be an extra shipping charge. This shipping included price is for the US 48 states.